Ein klassisches Automobil-Quartett mit 32 illustrierten Automobilen nach 1945. Das Kartenspiel besteht aus einer großen Auswahl Eurer Lieblings-Autos, die ich in Städten wie Cottbus, München, Stuttgart, Berlin und Lissabon gezeichnet habe. 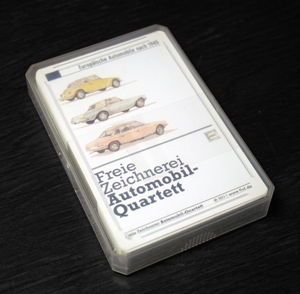 Spielt Quartett mit Euren liebgewonnenen Fahrzeugen, die nun Teil der Mobilitätsgeschichte sind. 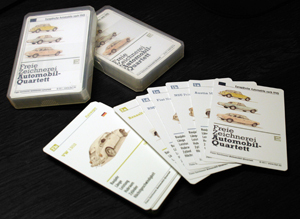 These unique playing cards feature illustrations of 32 favorite automobiles, a classic collection from the post-1945 era. 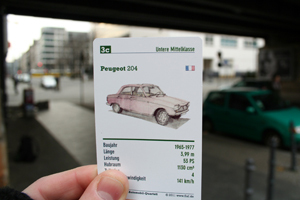 The set includes the drawings of a broad selection of models of vintage cars which I drew on site in cities like Cottbus, Munich, Stuttgart, Berlin and Lisbon. 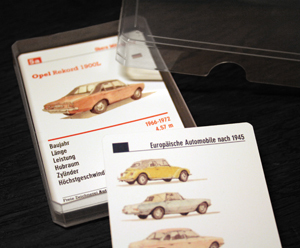 With this deck you can play favorite card games with cards that celebrate the design of much-loved vehicles that have become part of automotive history! 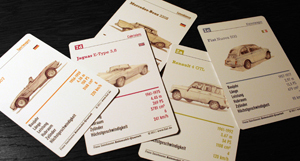 Including the following brands: Audi, Austin, BMW, Citroen, Fiat, Ford, Jaguar, Mercedes, NSU, Peugeot, Porsche, Renault, Saab, Volvo and Volkswagen. Contents: a special covering title card plus 32 illustrated playing cards (size 91 x 59 mm, printed on heavyweight 330 g cover stock), banded and sealed and packed in a transparent case. Besorgt Euch das Quartett in meinem Etsy-Shop! // Get the playing cards in my shop on Etsy!